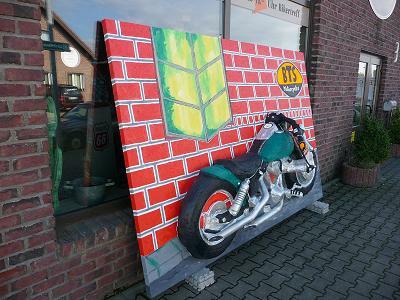 Imprint "3D-ART" gypsum, oil on artist canvas - original 1:1 copy of a Harley Davidson is first made ​​in plaster and mounted on artist canvas. Participation in the work of Blooom Award by Warsteiner 2012th. Imprint "3D Art" Gips, Öl auf Leinen. Originaler 1:1 Abdruck einer Harley Davidson. Das Teilnahmewerk an der Blooom Award by Warsteiner 2012.